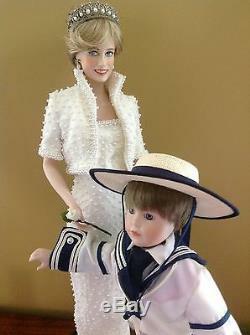 Historical Memorabilia, Royalty, Franklin Mint 1st Diana Princess of Wales Porcelain Doll and her oldest son Prince William Porcelain Doll, Danbury Mint. 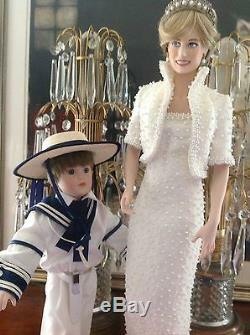 This exquisite Princess Diana doll is beautifully made of bisque porcelain and finely hand painted. Measuring approximately 17 1/2 inches tall. 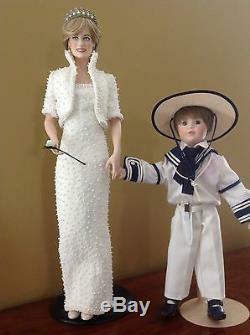 The dress the doll wears is an authentic recreation, beautiful long white gown with a stylishly detailed over jacket, covered with thousands of tiny pearls. 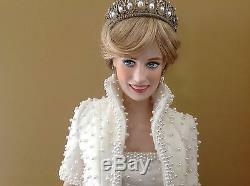 Her smartly styled blonde hair is crowned with a dazzling tiara set with 26 Swarovski crystal and 7 faux pearls. Her lovely earrings are decorated with additional crystals and pearls. She holds a single silk white rose. 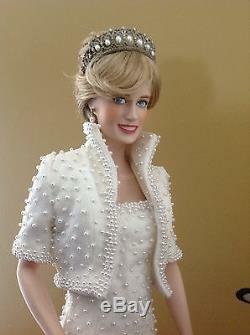 She comes with a certificate of authenticity and a repair packet of thread and pearls with instructions. In addition, she is displayed on a very nice stand. 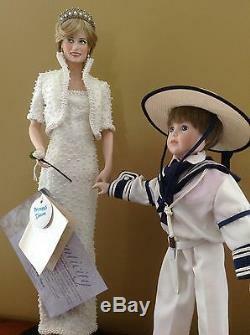 I was fortunate to find both these dolls at a high end estate sale. 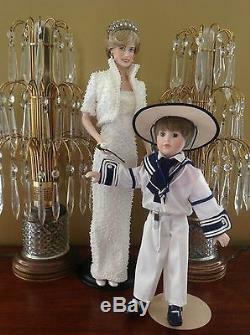 The Prince William doll is a Danbury Mint creation. This handsome bisque porcelain doll depicts William at the tender age of 4 years old. He stands approximately 12 inches tall and comes with a custom doll stand. 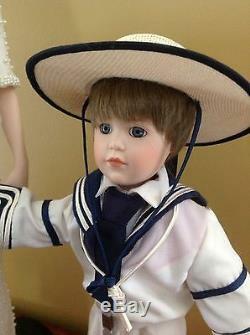 Sailor suit has a broad blue collar with Regatta stripes and beautifully hand tailored. Comes with a mariner's knife. Sennit hat which is so charming. Prince William comes with a certificate of ownership and a nicely printed story of the Royal Wedding. What a fine way to celebrate the upcoming passing of the beautiful Princess Diana, and the birth of William's son George. 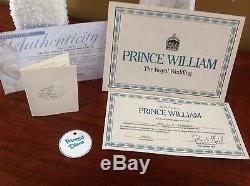 The item "Princess Diana Franklin Mint Prince William Danbury Mint Porcelain Hand Painted" is in sale since Tuesday, August 20, 2013. 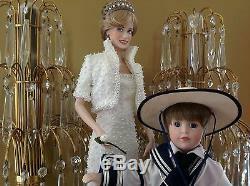 This item is in the category "Collectibles\Historical Memorabilia\Royalty\Princess Diana". The seller is "needfulthings0" and is located in Landrum, South Carolina.